Listing 09855377 has been removed. Contact us for additional information. 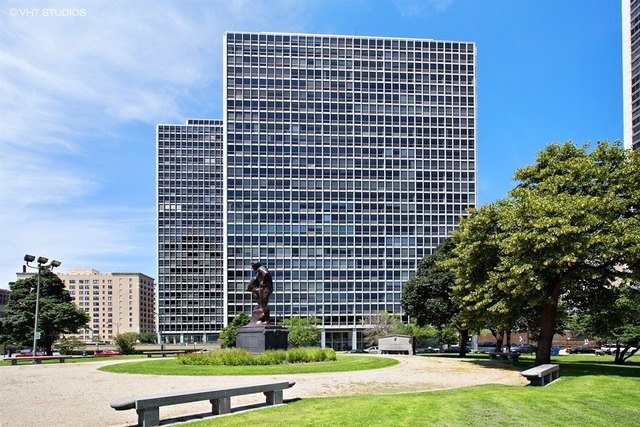 This stunning Mies Van der Rohe home has hit the market for the first time! Extremely rare, southeast combined corner unit has sweeping views of the city and lake. Three full bathrooms & three generous size bedrooms flooded with light from floor to ceiling windows with unparalleled views. The corner master bedroom suite has a walk in closet and spa bathroom. This complete gut renovation has spared no detail. The chef's kitchen includes Bosch appliances, incredible tile work, granite counters and floor to ceiling luxury cabinetry. A rare, truly high amenity property offers a 24-hour doorman, dry cleaner, receiving room, commissary/deli, laundry room, sundeck, grills, playground, hospitality room, storage lockers, bike room, exercise room & outdoor pool. Includes everything-HBO, wifi, basic cable, heat, water & A/C included in assessment. Located in the renowned Nettlehorse school district. Steps from the lakefront, CTA, Lincoln Park Zoo, Trader Joe's & endless dining & nightlife. Directions West on Diversey from inner Lake Shore Drive (note: Diversey one-way west when east of Sheridan). Property information last modified by seller on Monday, April 09, 2018, 04:09 PM CDT. Information Deemed Reliable But Not Guaranteed. Unauthorized duplication, use, or linkage is prohibited. The information on this web site is for personal, non-commercial use and may not be used for any purpose other than to identify prospective properties consumers may be interested in purchasing. Monthly Payment Calculator results are for illustrative purposes only, not a financing opportunity; calculations assume a 30-year fixed-rate mortgage and do not include closing and other costs. Property Tax on NEW properties is estimated at 1.5% of Listing Price for payment calculation purposes; actual value may be higher or lower.